The Rose, Jules R. and Stanford S. Setnor School of Music in the College of Visual and Performing Arts will present the 17th annual Prism concert, a 360-degree experience featuring light and sound, on Thursday, March 31, at 8 p.m. in the Rose and Jules R. Setnor Auditorium, Crouse College. The concert is free and open to the public. A reception will follow. The Prism concert is an annual production of the Setnor School’s music industry program featuring talented student performers from the school and from across campus. They include singer-songwriters, classical musicians, jazz funk combos and musical theater troupes who audition for the concert. 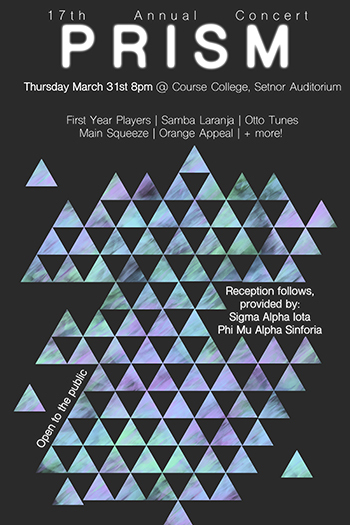 This year’s performers include First Year Players, Samba Laranja, Otto Tunes, Main Squeeze and Orange Appeal. Free and accessible concert parking is available on campus in the Q-1 lot, located behind Crouse College, on a space-available basis. If this lot is full or unavailable, guests will be redirected. Campus parking availability is subject to change, so please call 315-443-2191 for current information. For more information about the concert, contact Cassie Dailey at cmdailey@syr.edu.